Accueil » History of the Two Empires » Articles » Bullet Point #3: Did Napoleon “oppress” the Jews? Bullet Point #3: Did Napoleon “oppress” the Jews? Each “Bullet Point” will confront a question related to the First Empire. My remarks are designed to form the basis for debate and, I hope, research. 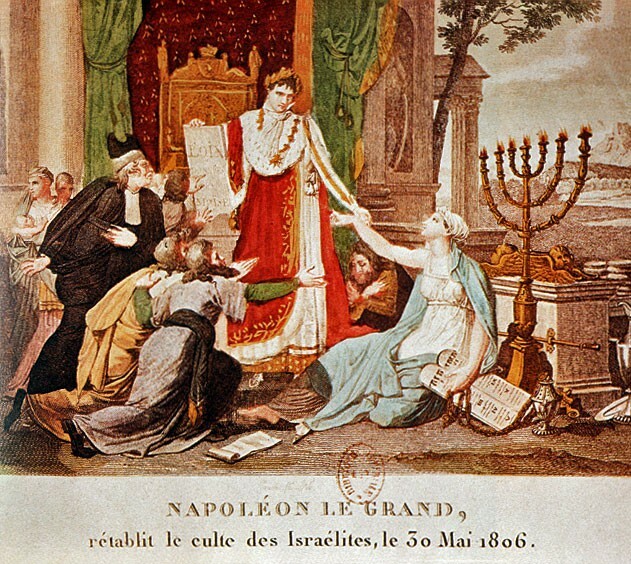 Having restored the Catholic religion, Napoleon extended this approach to the other religious denominations of his Empire: first, with the law dated 8 April 1802 for Protestants, in other words, the Reformed Church and Lutherans, and five years later for the Jewish religion, with several decrees aimed at better assimilating Jews into French society. The policy towards the Jews has been commented on in a variety of ways by historians, who continue to debate whether it was beneficial, intermediate or “infamous”, the latter term being more particularly reserved for the decree of March 1808 on the organisation of Jewish religion and worship in France. The French Empire included about 170,000 Jews, of which about a third lived – mostly grouped into ghettos – within the confines of what was formerly called France. While some individual Jews had been relatively well integrated into society (such as the Fould and Rothschild banking families), the community as a whole was poorly regarded by other citizens. The reputation as a “deicidal people” had something to do with it, but more important was the accusation of usury, since many Jews were involved in financial dealings or trade. This hostility was prejudicial to public order, and it was from this angle that Napoleon tackled the issue. He published a first decree (on 30 May 1806) proclaiming a one-year moratorium on debts contracted with Jews in the east of France while convening a meeting of Jewish notables in Paris (15 July 1806). The latter responded to a questionnaire designed to identify common elements among the various communities. Then a “Grand Sanhedrin” was convened, a gathering of seventy-one people (recalling the Sanhedrin of ancient times) including forty-five rabbis, to validate the answers supplied by the assembly of notables. Based on the conclusions of the Grand Sanhedrin, the government drew up four decrees (17 March and 20 July 1808) organising the administration of the Jewish religion and worship in France (the consistories, the appointment of rabbis, schools, etc.) but also providing for an oath of fidelity and the obligation for Jews to adopt “useful” professions (such as agriculture), to consider conscription as a sacred duty, and to recite prayers for the Emperor and his family, etc. A national “état civil” [personal vital records document] was also imposed. These provisions were well received by the communities. The decree dated 17 March 1808, on the other hand, advocated, for a period of ten years, “the social reform of the Jews” by reducing or even cancelling debts towards them, by creating a special patent (to be renewed annually by the prefects) for those who wanted to practice commerce, by regulating the mortgages that could be granted to them. In the same vein, foreign Jews could only settle in France if they acquired rural property. No Jews, even French ones, were allowed to live in Alsace any more. The system of conscription replacement in the armies was forbidden for Jews: from 1812 onwards, however, they could be replaced by other Jews. It is this text that is sometimes considered “infamous”. As unfair and severe as it may seem, in the long run it would have positive results, not only for the assimilation of Jews but also upon the way in which the rest of the population regarded them: within fifteen years, complaints of usury almost totally disappeared. In this matter, the Emperor had acted as a statesman in the context of the historical moment in which he lived. His mistrust of the Jews had no religious basis, only public order mattered to him. His choices were a stage of a long and difficult path, in a country that was still tempted by “anti-Semitism”. In 1808, and after 1810 when the “infamous” decree was relaxed, the Jews of the French Empire were the only ones in Europe to enjoy the freedom to practise their religion, given an official status, with rabbis officially recognized by the state. They were first “emancipated” before being integrated, a situation that was again unique in Europe. The restrictions and impositions demanded in return were in line with the Imperial policy of organising religions by submitting them to State control.